A Border Guard police officer was killed and three people were injured Thursday evening in two simultaneous terror attacks which took place in the Jerusalem area. 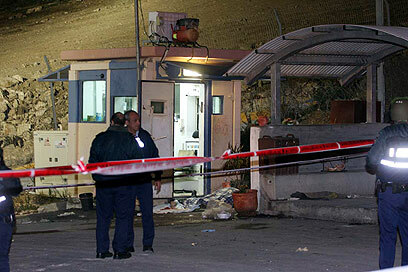 Two Border Guard officers were shot at the northern entrance to the refugee camp of Shoafat, north of Jerusalem. Twenty-year-old Lance Corporal Rami Zuhari of Beersheva was critically injured, and later died of his wounds despite paramedics' attempts to resuscitate him. Another female officer sustained moderate to serious wounds and was evacuated to the Hadassah Ein Kerem Hospital in the capital. An initial investigation into the incident revealed that two terrorists had approached the northern entrance of the refugee camp by foot. They fired at two Israelis and fled the scene. Police began combing the area with the help of a helicopter in a bid to locate the terrorists. One of the officers' weapons was missing, and police were looking into the possibility that the terrorists snatched the weapon. Fatah's military wing, the al-Aqsa Martyrs' Brigades, claimed responsibility for the attack and said that the cell members behind it had the officer's weapon. A Fatah spokesman told Ynet that the organizations "Black September" activists carried out the attack. Speaking at the scene of the attack in Shoafat, Jerusalem District Commander Aharon Franco said that the terrorists fired at the checkpoint. "We don't have a clear picture of what took place. We know that one terrorist or more arrived at the checkpoint. The officers didn't manage to respond and they fired at them. We began searching the refugee camp for suspects and eyewitnesses." Franco said that this was an open checkpoint, due to a High Court order. "If it were up to me," he said, "the checkpoint could have been closed, but the High Court imposed it as part of the life fabric." He added that Jerusalem was under a greater threat than most of the other cities in Israel. "There are general warnings all the time, but there was no concrete warning." Yesha Council Chairman Danny Dayan told Ynet that "the murder in Shoafat was carried out by terrorists from Fatah, the organization of Abu Mazen (Palestinian President Mahmoud Abbas), as were the previous murder near Nahal Telem and Kedumim. "These attacks prove that (Prime Minister Ehud) Olmert's policy of making gestures to Abu Mazen and releasing his terrorists and providing his forces with weapons – is costing us blood once again." Simultaneously, two terrorists broke into a yeshiva in the settlement of Kfar Etzion, located between Jerusalem and Hebron, armed with a gun and a knife and dressed in uniform. The terrorists threatened the students and the instructors with the weapons before being shot to death by the yeshiva's instructors, two of whom were lightly injured while struggling with the terrorists. The injured were evacuated to the Hadassah Ein Kerem Hospital by an MDA crew. IDF forces began searching the area for additional terrorists. Shaul Goldstein, head of the Gush Etzion Council, arrived at the scene of the attack and was briefed on the incident. After speaking with the yeshiva students, he told Ynet, "I told them that I love them and that they should remember that Jews have no fear. When the coward terrorists arrive, we fight them and defeat them." According to Goldstein, the fact that the incident did not end with worse injuries was pure luck. "Thank God it ended like this, and we should praise the yeshiva instructors for their courage and resourcefulness in doing the job and killing the terrorists," he added. Ran, a paramedic who arrived at the yeshiva shortly after the incident, said that the terrorists' bodies were lying on the ground. "The two terrorists who infiltrated the place were armed. They attacked with cold arms and were immediately shot by one of the students there. We arrived about five minutes after the incident and found the killed terrorists there," he said. Commander Aharon Franco told reporters that the Shoafat attack was not linked to the Kfar Etzion infiltration. Earlier Thursday, tthe police decided to limit the entry of male worshippers into Jerusalem's Temple Mount on Friday, for fear that radical elements will take advantage of the situation in the Gaza Strip and start riots at the end of the prayer. Following a discussion held at the Jerusalem District by Commander Franco, the police decided to only allow men over the age of 40, in possession of Israeli identity cards, into the Mount. See all talkbacks "Police officer killed, 3 injured in terror attacks in J'lem area"